1. Heat a heavy based pot over a medium-high heat. Melt butter and oil, add onion, garlic and dried sage. Cook stirring for 2-3 minutes or until onion has softened. 2. 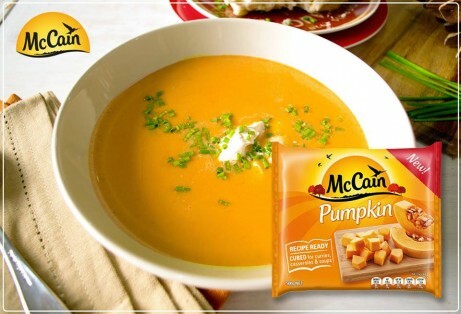 Add stock and bring to the boil, reduce to simmer and add McCain Cubed Pumpkin and potato. Cover and allow to cook for 10-15 minutes or until pumpkin and potato are tender. Remove from heat and set aside to cool for 5 minutes. 3. In batches, blend the soup mixture until smooth. Return blended soup to the pot and place over a low heat. Cook stirring for 2-3 minutes and allow to heat through. Add thickened cream and stir to combine. Season with salt and pepper. 4. Carefully ladle soup into bowls, top with sour cream and chopped chives. Serve immediately with bread. 1 Heat a heavy based pot over a medium-high heat. Melt butter and oil, add onion, garlic and dried sage. Cook stirring for 2-3 minutes or until onion has softened. 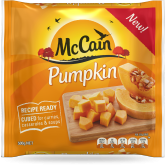 2 Add stock and bring to the boil, reduce to simmer and add McCain Cubed Pumpkin and potato. Cover and allow to cook for 10-15 minutes or until pumpkin and potato are tender. Remove from heat and set aside to cool for 5 minutes. 3 In batches, blend the soup mixture until smooth. Return blended soup to the pot and place over a low heat. Cook stirring for 2-3 minutes and allow to heat through. Add thickened cream and stir to combine. Season with salt and pepper. 4 Carefully ladle soup into bowls, top with sour cream and chopped chives. Serve immediately with bread.